The Karlskrona to Gdynia ferry connects Sweden to Poland and is operated by Stena Line. 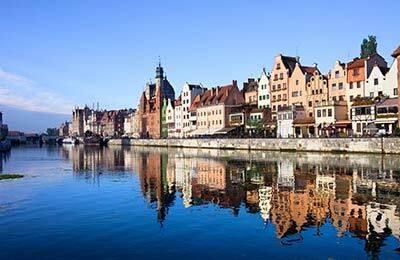 As well as comparing prices and times for Karlskrona to Gdynia, we will also show you results for Nynashamn to Gdansk and Ystad to Swinoujscie to help you get from Sweden to Poland at the best time, for the best price. 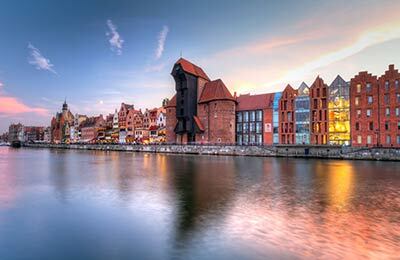 The average price found by our customers for Karlskrona to Gdynia recently is £430. Book a Karlskrona to Gdynia ferry today with AFerry. Just use the form above and choose the route that you want. If nothing appears automatically, start typing Karlskrona. You can also type the country or even the name of the ferry company you are interested in. When you have the route that you want, choose single or return and all the other options you want. If there is more than one ferry company operating on the Karlskrona Gdynia route we will show you all the ferry companies, to make sure you get our best price. We'll also show you any routes similar to Karlskrona to Gdynia so you have the complete picture when making your booking. And of course you'll also see a range of times just in case it's a bit cheaper earlier or later than your preferred booking time. Once you've chosen your perfect sailing and have made your booking we'll email you your booking confirmation for your Karlskrona to Gdynia ferry. The majority of tickets have instant confirmation. Below you can see the ferry company or companies that sail on the Karlskrona to Gdynia route and the journey times. You might also see some recent prices our customers have found. The best way to find a cheap Karlskrona to Gdynia ferry though is to use the form above today to see all of our possible choices. With AFerry we always give you our best prices for ferries from Karlskrona to Gdynia. No matter which page you book from we always include all our special offers. And there is no need to look for a discount code. If we have an offer available, your ferry price will include the reduction or offer. There's no need to look at other websites. If you're not sure if the Karlskrona to Gdynia route is right for you or you can't decide between ferry companies, if there is more than one, you might also find it useful to read any reviews we have available. We ask all our customers to send us reviews for Karlskrona to Gdynia ferries. Remember though, that the earlier you book, the cheaper prices normally are. So don't spend too long deciding! Karlskrona to Gdynia is a popular route, so we advise you to book as soon as possible. Gdynia is a young city that has many cultural attractions, film festivals (the "Polish Cannes"), Summer Jazz concerts and the popular Musical Theatre. In June, Gdynia celebrates the "Marine Festival" which is famous internationally. Exploring the town and the harbour you will find many bars and restaurants and Gdynia also offers a buzzing night life. The city was constructed after the seaport. Situated on Gdansk Bay, Gdynia is now a dynamic city with nearly 260,000 inhabitants and it is Poland's "window to the world". Situated on a scenic coastal landscape and with the forest on the hills around it, Gdynia offers a great variety of outdoor activities. In Gdynia there are activities such as walking, cycling, diving courses and expeditions, as well as mountain bike competitions and motor boat driving lessons. Furthermore, in Gdynia you can enjoy the beautiful beach awarded in 2005 with the prestigious Blue Flag. Ferry was fine. Food was excellent in the table service restaurant. Only niggle was being expected to vacate cabin by 6.30 when the ferry doesn't arrive until 7.30am.